Change for Good is an innovative partnership between UNICEF and the international airline industry. Established in 1987, it is one of UNICEF's best-known and longest-running partnerships. Currently ten international airlines support the Change for Good program. Thanks to the generous support of customers and participating airlines, the global Change for Good program has generated more than $156 million, which has contributed to UNICEF’s efforts to helping save and improve the lives of millions of children around the world. In the United States, American Airlines has been the participating airline of the program since 1994. Travelers on selected international American Airlines flights can donate unused U.S. and foreign currencies onboard the aircraft to help UNICEF in its mission to put children first. As donations of foreign coins are processed in bulk by a third party vendor, please note that the acknowledgment you receive for your donation will not specify the amount of your gift. American Airlines AAdvantage members can donate their AAdvantage miles (1,000-mile minimum) to support American’s Kids in Need program which supports children’s charities including UNICEF USA. American Airlines and UNICEF USA are working together to save and improve children's lives by creating an opportunity for American‘s employees to get involved in UNICEF's Change for Good program. "Champions for Children" is a volunteer program designed to empower flight attendants and other American Airlines employees to take action for children as they perform everyday work duties. Change for Good on American Airlines is proudly supported by the Association of Professional Flight Attendants (APFA). Change for Good on American Airlines could not exist without the incredible volunteer support of Champions for Children. Registered Champions for Children can access a special website created exclusively for them. (Please note that the Champions for Children program is only open to American Airlines employees.) To learn more or to become a Champion for Children, you may visit "Employee Programs" on Jetnet, the American Airlines corporate intranet. Each year, Champions for Children have the opportunity to vote on a UNICEF project to support a portion of funds collected through Change for Good. In 2017, Champions for Chlidren voted to direct funding to support UNICEF nutrition projects in Guatemala. 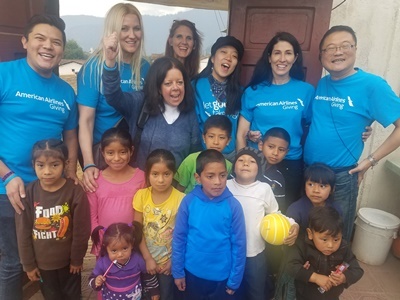 In April 2018, six flight attendant Champions participated in a UNICEF field visit to Guatemala where they saw first-hand how Change for Good collections were making a positive impact in the lives of women and children in country. Congratulations to our 2017 Champions of the Year! 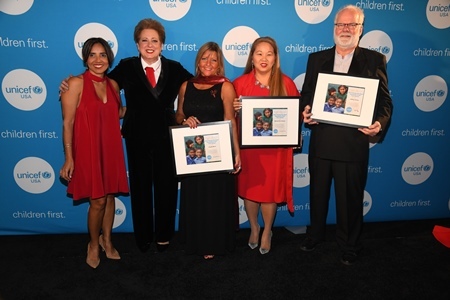 On February 3rd, 2018, UNICEF USA and American Airlines honored four outstanding Champions for Children – Claudia Berra, Jeff Lemley, Dottie Princi, and Kisu Sawyer-Brooks – for their commitment to UNICEF’s Change for Good program. These Champions have gone above and beyond the call of duty and were nominated by their peers for their passion, leadership, and dedication to children around the world. They were honored by UNICEF USA President and CEO, Caryl M. Stern and American Airlines Community Relations rep Cynthia Barnes at the Annual UNICEF Children's First Gala.